Adobe has just updated Photoshop CC so the heavyweight image editor now supports the Touch Bar on Apple’s new MacBook Pros. There are three main batches of controls provided for the Touch Bar, the first of which is Layer Properties. This gives the user quick access to Select & Mask, adjusting layer visibility and opacity, and things like placing a smart object and scrolling through the available blend modes. Secondly, there’s a section for brushes which lets the user easily adjust the brush color, size, opacity, hardness and flow (via a simple slider). And finally, you can head to Favorites which allows you to customize and build your own set of favorite actions, such as adding a new layer, or flipping vertically/horizontally. You can also add controls for duplicating a layer at a touch, invoking fill mode, and swiftly sharing a preview of the image you’ve edited. Adobe says it is planning to work further on support for the Touch Bar, so doubtless we can expect refinements and tweaks to this scheme of things in the future. As ever, it’s a good idea to provide feedback if there’s anything you think would work particularly well with the context-sensitive touch strip on the MacBook Pro. You can update your software to the latest version of Photoshop with support for the Touch Bar by heading to Help > Updates in the program. 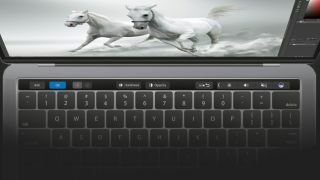 Other apps which are compatible with the Touch Bar include Apple’s Final Cut Pro video editor, 1Password and djay Pro. Or alternatively, you can turn the OLED strip into a tiny piano. You pays your money and takes your choice, as they say, but seeing as folks paid a hell of a lot of cash for their new MacBook Pro, it’s great to see a true heavyweight of an app now being supported.